Does the Bible really say God made childbirth painful? Have you ever heard of 'Eve's curse?' In relation to childbirth, this term is generally used in reference to God cursing Eve in Genesis 3:16, and thus women, with pain as they birth their offspring. Well if not, you have now. Eve's curse was talked about at a church I visited the other week. The speaker insinuated that the terrible pain women suffer in childbirth is the result of God's curse placed on Eve. I looked around at the many pregnant women in the congregation; gleefully nodding in agreement, their protruding bellies revealing to the world that labour is fast approaching for them, and doing little to rouse contempt for the speaker's theology. I couldn't help wondering what it would be like for these ladies going into labour in the next few weeks. Would their minds remember this sermon when the first contraction starts? Would they go into labour anticipating excruciating pain? Surely, I thought, given what psychological science now knows of the power of the mind, this kind of thinking would be predisposing them to have exactly that, painful labours. But why would God inflict such physical pain on labouring women? Of course, after the fall childbirth is subjected to the disorder, as is the environment, relationships and physical health. However, why is childbirth particularly selected to have the specific curse of pain placed on it? Why would God use such an incredible event to punish us? What about women who don't experience any pain in childbirth at all? Or those who do not have children? Is God's punishment reserved for those who procreate? Does that mean we should not alleviate pain in childbirth because God wants it there? Many people throughout history from Hippocrates to Aristotle, leaders of the Grecian School of Medicine, wrote of childbirth but certainly did not mentioned pain in their notes of normal births. However, at the end of the second century A.D there arose a deep animosity against women. Pregnancy was viewed as a carnal sin and medical personal were forbidden to attend labouring women. It was this time that a view of God decreeing childbirth to be painful became popular. In sixteenth century midwifery began to come back. But still, Genesis 3 verse 16 generated a belief that God had cursed childbirth. It was the reformer, Martin Luther, who said, 'if women become tired, even die, it does not matter. Let them die in childbirth. That's what they are there for'. OUCH! With the coming of the Renaissance there was still a belief that God wanted childbirth to be painful. When it was suggested that pain relief in the form of chloroform be used, a New England minister said no because that would deprive 'God of the pleasure of their deep, earnest cries of help'. Women in the Christian world feared birth and the pain God had cursed it with. Slowly, birthing became institutionalized and women trudged off to the hospital to birth their babies. This move increased women's fear of birth. Rightly so, many died in hospitals from infection. No wonder women still fear birth, even though we have very safe birth in the Western world. Fear is etched into a birthing mother's conscience. Ask a pregnant woman about how she is approaching the birth of her baby and you'll find most are preparing themselves for excruciating pain. However, some women do not accept that excruciating pain in childbirth is God's curse on women. These women, including myself, start with the premise that for most women it should not be excruciatingly painful. Such women go into labor with little to fear about. And the results are often amazing (of course there are exceptions). Women speak of bearable and even enjoyable labours. The truth is, fear is the enemy of the birthing room. Fear has a tendency to freeze labour. This can lead to a plethora of interventions and pain. When a woman is in fear the muscles of the uterus work against each other, instead of in unison. This 'doctor's note' can result in excruciating pain. Don't believe me? (Probably rightly so as I have no medical training what-so-ever). Well, look at societies that have not been influenced by Western civilization, women often give birth with relatively no ordeal and with minimum discomfort. For example, a pregnant woman is out working in a field, until she feels a few strong contractions. Going in from the field, she walks around the side of the house, leans forward with her arms holding herself up against a wall and pushes out her baby, catching it herself. Very different, I think it's safe to say, to birth in Australia. There seems to be a lot of debate about the Hebrew word in question here. So I wouldn't want to be too dogmatic about this. The word that is often interpreted as pain or sorrow is used 16 times in many versions such as the King James Version of the Bible. It is usually translated to mean 'labour, toil, work' except when in relation to childbirth, it is translated to mean 'pain, sorrow, anguish or pang'. This can change one's understanding of the text. For example, the use of 'toil' instead might not insinuate God is making childbirth painful. Maybe bringing children into this life and raising them up will all be difficult compared to what it was like in Eden. It is just another example of all parts of life being harder because of the original sin. If we go around telling women that God cursed childbirth with terrible pain, those that believe this message are likely to have more pain in their labours because of the effect of fear. If this is the case, I find it hard to believe God is keen on us preaching childbirth is painful because God cursed it. God wants us to alleviate suffering as we follow in the footsteps of Christ. Nonetheless, I want to be faithful to the Bible. Just because I dislike the idea of God cursing childbirth does not mean I can simply do 'theological gymnastics' until I make Genesis into a passage that suits me. I do not wish to do this. I do however think becoming a keen student of theology means we will take the time to re-evaluate commonly accepted theological stances. 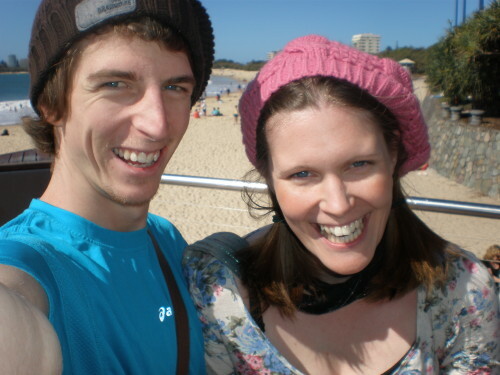 Danielle and Daniel Stott are Bible College graduates who live on the southern Gold Coast. Daniel is training to be a teacher and Danielle is caring for their baby daughter.